CBLDF has joined a coalition led by the National Coalition Against Censorship to condemn the removal of a student’s painting from an exhibit in the U.S. Capitol. The untitled painting by 18-year-old David Pulphus had ignited a figurative tug-of-war in which Missouri Rep. Lacy Clay had to restore the painting on multiple occasions after other legislators in the building took it upon themselves to take the painting down. The painting is just one among dozens of student artworks from across the country selected to hang in a corridor of the Cannon House Office Building for one year as part of the Congressional Art Competition. 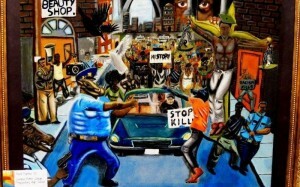 Pulphus’ work depicts a protest march foregrounded by a police officer aiming his weapon at an unarmed subject. At least one officer in the painting is shown with the head of a boar, while his target appears to be a wolf or black panther. Also prominently featured in the painting is a young African American man crucified on the scales of justice, and protest signs such as “RACISM KILLS.” Pulphus completed the painting while he was a student at Cardinal Ritter College Prep High School in St. Louis. Political artistic expression is protected speech, no matter how controversial or offensive some may find it. Criticism of government actors such as law enforcement officials is one of the foremost reasons why we have the First Amendment. Citizens’ freedom to speak out against perceived governmental abuses and injustices is necessary to the health of our democracy: were government able to silence such criticisms, meaningful political discourse would be rendered impossible. Removing the work sends a message to young people — and everybody else — that they should not depict the world around them for fear of offending our political representatives. At a time when we have a new administration and nationwide concerns about free speech, the censoring of an artwork because of its viewpoint is a deeply disturbing and divisive act in an already polarized nation. American Civil Liberties Union, American Civil Liberties Union of the District of Columbia, American Society of Journalists and Authors, Authors Guild, College Art Association, Free Speech Coalition, Index on Censorship PEN America, Vera List Center for Art, and Politics Washington Area Lawyers for the Arts joined CBLDF in signing NCAC’s statement. You can view NCAC’s press release and the full statement below. Help support CBLDF’s important First Amendment in 2017 work by visiting the Rewards Zone, making a donation, or becoming a member of CBLDF!